No wonder Gold Mound is a brilliant choice for Southwest Florida landscapes. Its neon yellow foliage will engage every passerby, even if your home is tucked back far away from the street. As far as evergreen shrubs go, this species dazzles every time, even if you just want a spot of it – well, especially if you want a spot of it. That’s because Gold Mound Duranta is best used sparingly as strategic pops of color in your Southwest Florida landscape. Think of it as an exclamation point within the paragraphs of your plantings. For instance, it’s a great choice for accenting the deep ruby reds of a Copperleaf hedge. It can also complement an elegant grouping of burgundy Loropetalum, add whimsy to a birdbath or serve as an ideal, non-messy container plant for your lanai. 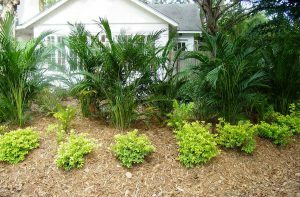 The beauty of Gold Mound is that it punches up almost everything you pair it with – even when planted in front of dark-green plant material like cat palms. Gold Mound is an even more enticing choice when you consider its low-maintenance qualities. Plant in well-drained soil where it will get full to part sun (more sun helps maintain its bright color). Regular watering and shaping are pretty much all that’s left to do, other than applying a granular fertilizer in spring, summer and fall. You’ll want to give this moderate grower a nice healthy pruning in the spring and keep it at 2.5- 3-feet tall. The stems have tiny thorns, so be sure to wear gloves to protect your hands. Oh, we forgot to mention: Gold Mound does bloom, but the flowers are so tiny you can barely see them (but butterflies sure can). But if you look closely, you’ll see little lavender lovelies. And another thing to note: Watch out for frost. Sometimes the leaf tips get damaged but they usually bounce back in zones 9b through 11. Ready to add this lovely evergreen shrub to your landscape? Ask your local landscape professional for help in determining just the right placement. 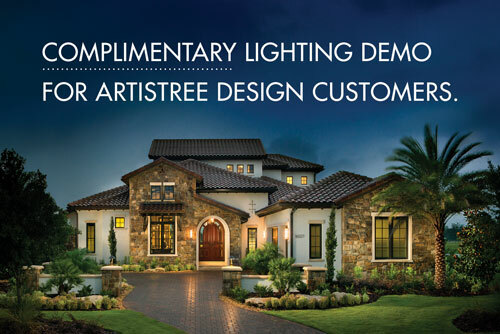 Or, if you happen to live in Sarasota, Manatee or Charlotte counties, this is your golden opportunity to request a consultation with one of ArtisTree Landscape’s award-winning designers for a complete landscape renovation. They’ll be more than happy to assist you. Call Jenni Lassen at 941.488.8897, or visit artistree.com. 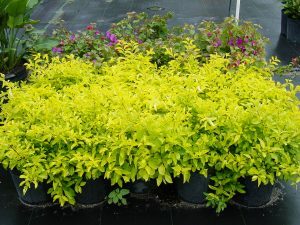 Gold Mound Duranta adds a pop of color to any Florida garden. You can find it at almost any Southwest Florida plant nursery, too.